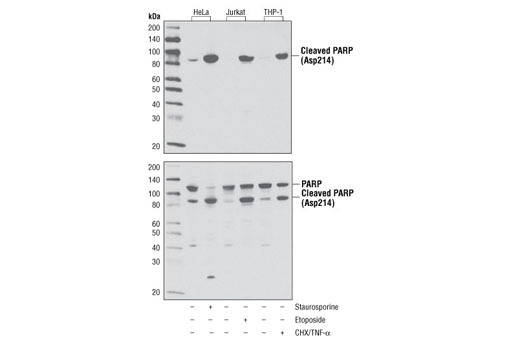 Cleaved PARP (Asp214) (D64E10) XP® Rabbit mAb detects endogenous levels of the large fragment (89 kDa) of human PARP1 protein produced by caspase cleavage. 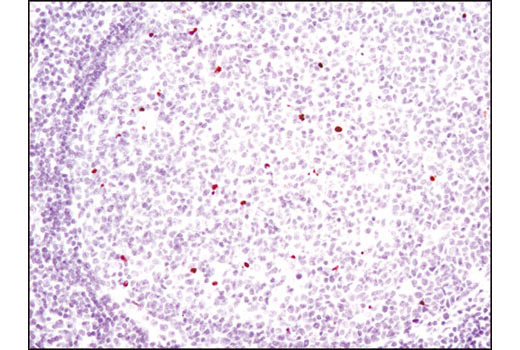 The antibody does not recognize full length PARP1 or other PARP isoforms. Monoclonal antibodies are produced by immunizing animals with a synthetic peptide corresponding to residues surrounding Asp214 in human PARP. PARP, a 116 kDa nuclear poly (ADP-ribose) polymerase, appears to be involved in DNA repair in response to environmental stress (1). This protein can be cleaved by many ICE-like caspases in vitro (2,3) and is one of the main cleavage targets of caspase-3 in vivo (4,5). In human PARP, the cleavage occurs between Asp214 and Gly215, which separates the PARP amino-terminal DNA binding domain (24 kDa) from the carboxy-terminal catalytic domain (89 kDa) (2,4). 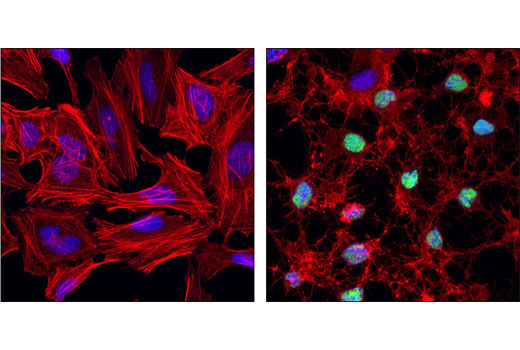 PARP helps cells to maintain their viability; cleavage of PARP facilitates cellular disassembly and serves as a marker of cells undergoing apoptosis (6).